Anyone involved in a car accident knows how the dent got there. But how annoying is it to look at your vehicle and find a dent or ding that you had not seen before? And how did you get a dent without you knowing how it was accrued? Then once you see the dent, sticking out like a sore thumb, it gnaws at you. Every time you glance at your once pristine car, that dent or ding will be the first thing you think about until you get it repaired. 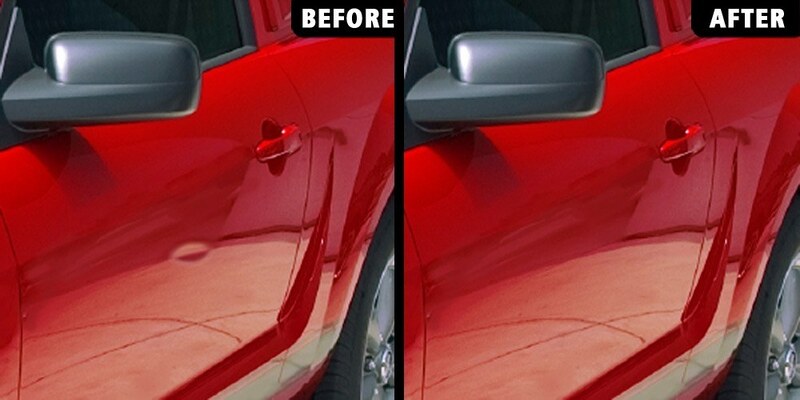 If you are looking for dent removal in Vaughan for your vehicle, we recommend that you consider Pfaff Autoworks today! With our state or the art equipment and knowledgeable technicians, we can get your car dent removed quickly. Read on for more information. The Car Wash: A car wash can clean your vehicle up and have it looking pretty, but it can also leave a dent that you did not want. Inspect your vehicle after every wash, so that there are no surprises after you get home. Other Car Doors: Another vehicle’s door can cause a dent if they are parked too close or aren’t able to control the opening of their door. This could happen in a parking lot or a garage, often when you aren’t around. Shopping Carts: It’s sad, but sometimes fellow shoppers are lazy, not putting their shopping cart away after use. Parking lots then can become danger zones, littered with unmanned carts. This type of negligence leads to dents on unexpecting vehicles and angry vehicle owners. Sporting & Music Venues: Dents can happen here. Drunken fans tripping into vehicles, errant balls being thrown and bouncing off hoods, and bad drivers are not looking to where they are going because they are in a rush to get out of the venue. Mother Nature: With our unpredictable weather patterns in Canada, hailstorms can be a dangerous dent culprit. If a strong storm comes rolling through, and you didn’t prepare correctly, it can leave several dents, even invisible one. This is where you need a dent expert to find the dents and dings to remove them properly as to not devalue your car. At Pfaff Autoworks, we have the equipment necessary to safely perform dent removal on your car in Vaughan. Our expert technicians know what to look for with smaller invisible dents, and they can also successfully remove bigger more serious dents. For more information about our dent removal services in Vaughan at Pfaff Autoworks, please feel free to continue browsing through oru website. Click here to find our contact information and to fill out our contact form.